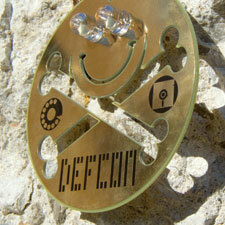 The DEFCON 14 Badge was created for the 2006 edition of DEFCON, the largest and oldest continuously running hacker and computer security convention in the world. 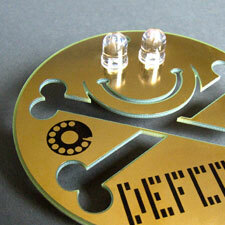 The badge, which used active electronics and was intended to decrease counterfeiting while still provide intentionally open circuitry to allow attendees to experiment with and modify the badge to their liking, was the first of its kind for DEFCON. Over 6,000 badges were manufactured and were sold out within hours of the convention’s opening. Some of the design challenges included keeping total badge, assembly, and testing cost under $5 per unit, ensuring that the battery would last the length of the conference (at least three days), and creating the artistic design elements of the printed circuit board. Seven different soldermask colors were used to denote the different DEFCON clientele: Human, Goon, Press, Speaker, Vendor, VIP, and Limited Edition (created specifically for Grand Idea Studio and the DEFCON organizers). To celebrate the unique and “hackable” nature of the badge, Grand Idea Studio hosted the DEFCON Badge Hacking Contest to award the most obscure or mischievous badge hack completed over the weekend. The winning submission, named the Event Generator Ghoul (EGG), was created by Scott Scheferman (Shagghie), an audiophile and DJ. Scott modified the LEDs on his badge to serve as event generators into his analog synthesizer. He connected the hacked badge to his Cwejman synthesizer’s envelope generator and LPF cutoff frequency modulation jacks via a 1/4″ stereo plug. 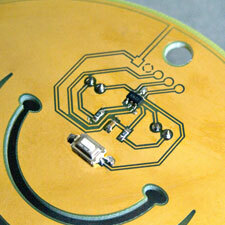 He also installed two piezo buzzers/tweeters onto the badge to verify his initial concept and for debugging purposes. Other notable mentions of the contest include Zane’s flame thrower, Major Malfunction’s “TV-B-Goon,” Dr. Volts’ multi-colored blinking badge with ashtray reflector, and Mark’s firmware hack to enable the badge’s LEDs to blink “DEFCON 14” in Morse code.